How does a four-time all-conference, three-time player of the year not get in the hall of fame after nearly 20 years? Forgive me if the following reads as though I am in my feelings. You see exactly two weeks ago, St. Paul’s College and the basketball world lost someone who was beloved to many of us and it has put me in a space of reflection. Our beloved Coach Ed “Buck” Joyner left a lasting impression and I always felt (as he admitted to me on a couple of occasions) that he didn’t get the recognition we felt he rightfully deserved. He built the CIAA’s no-man’s land into a perennial powerhouse in the mid ‘90’s but over that span was never recognized as Coach of the Year. See, Buck was the perfect fit for little ole’ Lawrenceville, Virginia and as a legendary pitchman was the ONLY person who could sign, seal and deliver a once-in-a lifetime basketball enigma to Saint Paul’s College; and that’s exactly what he did. I won’t stand by and let it happen to another. The recognition. It’s long overdue and Antwain Smith belongs in the CIAA Hall of Fame. I remember sitting by and watching ‘Twain heartbroken when, incredulously he was not voted as the 1996 CIAA Rookie of the Year. That honor went to the talented LaFonte Moses from Saint Augustine’s (College). Now while Moses was a bad boy, it didn’t add up because Antwain was named All-CIAA. Yes, the CIAA coaches knew what was on the horizon and voted for a freshman to stand amongst the conference’s elite. We all tried our best to encourage him in his moment of despair but the snub had stoked a fire in Smith. The next three years he made everyone a believer. 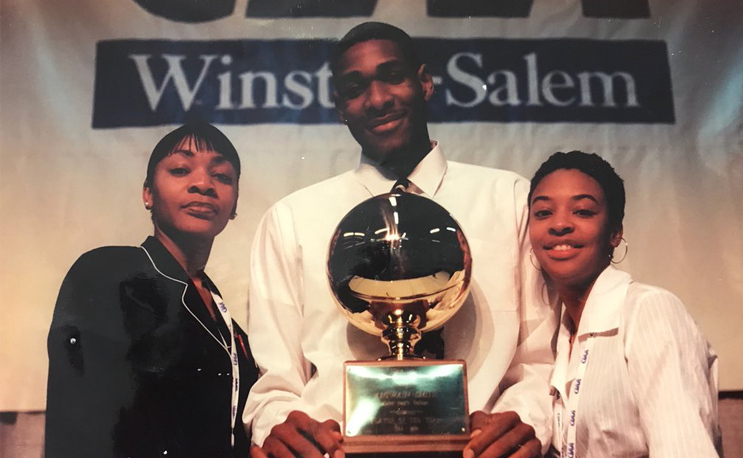 The only three-time CIAA Player of the Year (Norfolk State’s Ralph Talley also won it three times, but shared the award one season), three-time All-American, four-time All-CIAA, averages of 20 points and 9 rebounds during his CIAA career; MVP of the Portsmouth Invitational (when it was HUGE) and the 51st overall pick in the 1999 NBA Draft (Vancouver Grizzlies). Did I mention he was the marquee, box office player that dominated the league for four years? His athleticism and rim play was legendary. Believe me…if we had the ability back then to submit the way he wreaked havoc on basketball rims around the CIAA, he would have been SportsCenter Top 10 mainstay. This should be a no-brainer, common sense and I feel some kinda way about it. As a Sports Information student-assistant at Saint Paul’s, I was witness to and documented Smith’s entire career. I owe a lot of my career to him. Promoting ‘Twain, also a dear friend of mine, caused a beautifully hectic time in my life but foundationally, it gave me everything I needed to know. We are approaching two decades since his collegiate career concluded and I see my work is still not done. Let it be understood, I have no intention of letting up, and will continue to remind people of his story, until the CIAA does right by him. I have watched several CIAA Hall of Fame classes roll out but nothing ever made me flinch. Well I take that back. The Stephen A. Smith thing was a bit puzzling, especially after the way he denounced some of our member schools combined with his less than mediocre athletic career but I digress. This Smith, as in Antwain, DESERVES to be in. There are current Hall of Fame members that whose careers came and went after Antwain finished at Saint Paul’s. His career was stellar and predates many and they have still gotten the nod BEFORE him. It just doesn’t make sense. I have also witnessed several years where as many as three honorees from the same institutions have been inducted the same year. It seems to be a common thread, almost an automatic for certain choice schools. Now admittedly this will be the third cycle where Smith has been up for consideration so anything prior to 2016 I will give a pass to. However, conventional wisdom and inquiring minds need to know. Someone with Smith’s credentials should be first ballot, first time, PERIOD; and something tells me that if the colors he wore were Scarlet or Maroon, he would have been in with little hesitation. To let it go on this long is an injustice and the process lacks integrity at the fact that he has been looked over for the past three years. An observer recently remarked to me that Smith and Ronald “Flip” Murray were the best two CIAA basketball players they had seen in the past 20-plus years. Twain’s career spanned 1995-1999, Flip (CIAA Hall of Fame, 2016) also a friend of mine, played from 2000-2002. See where I’m going with this? So hopefully this is first and only time I will have to break out my Mac because his name will roll out with the class of 2019. But as I previously stated, I wrote Antwain Smith’s collegiate bio and began my career promoting him and I will continue to until it is so. I got time…and more receipts. April Emory is a 1999 graduate of St. Paul’s College. A recipent of the CoSIDA College Division Award, Emory spent a decade-and-a-half at Elizabeth City State University were she was selected as CIAA Sports Information Director of the Year. She is currently the Assistant Athletic Director for Communications and Marketing at Albany State University. Did Smith get any attention from NBA scouts!!!!! April, as a former St. Paulite (1985-89) please keep up the good fight for Mr. Smith… The honor is well deserved and loooong overdue.